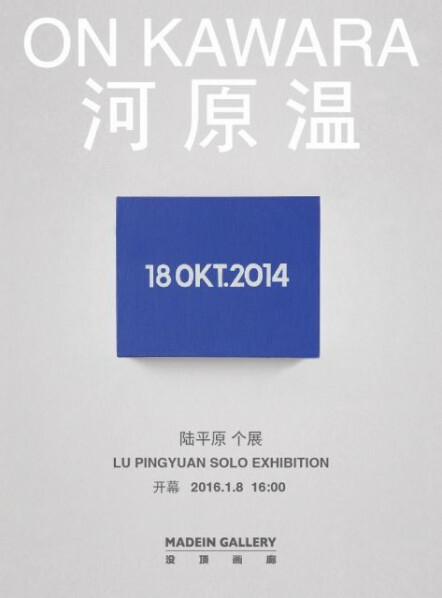 MadeIn Gallery is pleased to present On Kawara, an exhibition of Lu Pingyuan’s new works, ensued from a commitment he made to the artist On Kawara. On Kawara is one of the most important conceptual artists from the Twentieth Century. Born in Japan, he traveled in 1959 to the U.S, Europe, and settled one year later in New York. From 1966, he started to create works based on time and various elements related to his life. The existentialist topics, post-minimalist character and extreme creating attitude all impart On Kawara’s works with profound art and humanistic values. On Kawara’s representative work One Million Years subtly reveals the intricacy of measuring time, as well as human’s limited notion of time. The work comprises two parts, One Million [Past] where each year from 1969 to one million years before is noted, and One Million [Future] unfolding one million year starting from 1996, immersing concepts of human history, nature, mathematics and even philosophy. Through this work, On Kawara used his physical perception of and interaction with his surroundings to measure the perpetual existence time. In his whole life, On Kawara followed this pursuit of the accuracy of “time” and “existence.” After 1966, he decided not to attend exhibition opening anymore, and refused journalists’ interviews. He stopped keeping photographs, and didn’t add any personal information or images to his works. His biography didn’t mention his year of birth, but only the number of days he lived. By giving only objective information about himself, On Kawara completely wiped “individualism and ego” off from the public eye. On July 10, 2014, his representing gallery in New York, David Zwirner, announced his death. He was 81 years old. On Kawara began his Today series in 1966, and continuously produced them up until the end of his life. In this work, he painted, on a monochrome surface, the actual year, month and day in the language used by the country he was in. Whenever the painting wasn’t accomplished within the day of its creation, he would destroy it. These date records became an intersection of life and existence in time. Through a simple yet cruel way, On Kawara reminded people that human life cannot recover the vestiges of the past and that annihilation is unavoidable. These dates belong to the life of On Kawara, and to all the living entities existing within the flow of time. At the end of year 2014, Lu Pingyuan began to paint Today series. Lu Pingyuan related that he dreamed of a man standing in light. Although he couldn’t clearly see his face, he could perceive that it was On Kawara, and apprehended that he was asked to pursue the creation of the Today series. Lu Pingyuan promised he would. This commitment although gloomy, is pervaded with a certain romantic tone. When waking up, Lu Pingyuan started to make research and studied details of the production process of this body of works by On Kawara. Soon after, he began the creation of the Today series. Courtesy of the artist and MadeIn Gallery.